Knives of all sorts have been a popular means of advertising for well over one hundred years. The better the quality, the more likely the knife will be kept handy by the owner. The advertising message will be read time and time again. 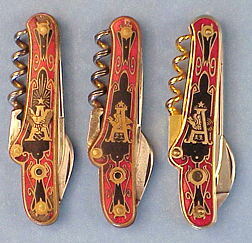 The corkscrew knives most sought after are the Anheuser-Busch champagne pattern pocket knives. Over 65 varieties of these were produced in the late 1800s and early 1900s to be given away by Adolphus Busch during his world travels. Lest he not be forgotten, a photo of him was included in a peephole or Stanhope lens mounted in the knife. Some had a second peephole picturing the brewery. The oldest A-B knives have the Eagle in A trademark showing the eagles wings folded back into the letter A. 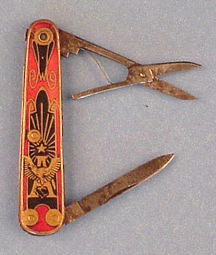 Later knives show the trademark with spread wing eagle. 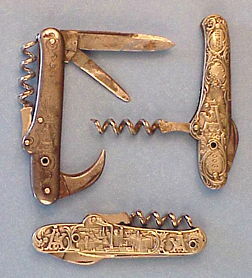 Collectors of knives, breweriana, advertising, Anheuser-Busch, stanhopes, and corkscrews compete aggressively for these knives. Knives with missing or broken stanhopes and blades lose a considerable amount of their value. 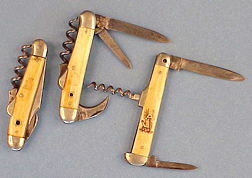 Two promotional knives with stanhopes from C. Conrad & Company who distributed A-B products in the late 1800s. Foil cutter blades marked HENRY BOKERS IMPROVED CUTLERY. 3 3/8. Top: Budweiser / Moss Rose. Bottom: C. 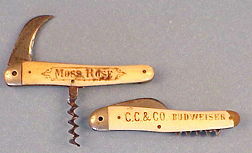 C. & Co. Moss Rose / C. C. & Co. Budweiser. Carl Conrad was a wine merchant in St. Louis. After drinking beer in Budweis, Bohemia, he obtained U. S. brewing rights and called his beer Budweiser. He contracted with Adolphus Busch to brew his beer and thats how the King of Beers started. Three stanhope knives with bone handles. 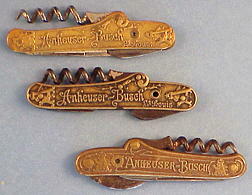 Left to right markings on blades: ANHEUSER-BUSCH; SCHULDER BROTHERS MADE IN GERMANY; ANHEUSER-BUSCH GERMANY. Although the crown cork was introduced in 1892, Anheuser-Busch did not adopt the crown cork until 1903. Some Anheuser-Busch beer was corked until 1914. Three stanhope knives with Mother-of-Pearl handles. 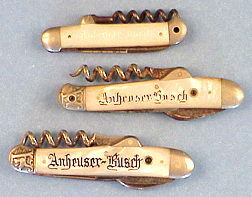 Top to bottom markings on blades: ANHEUSER-BUSCH MADE IN GERMANY; ANHEUSER-BUSCH MADE IN GERMANY; ANHEUSER-BUSCH GERMANY. 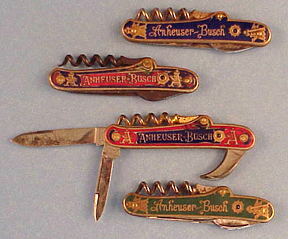 Four enamel knives marked ANHEUSER-BUSCH MADE IN GERMANY or ANHEUSER-BUSCH GERMANY. 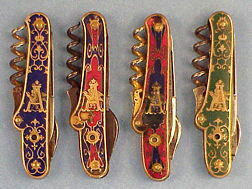 Three enamel knives. 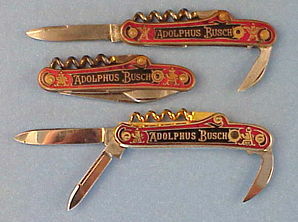 These three are different from most of the other knives shown in this article in that they say Adolphus Busch instead of Anheuser-Busch. Some say this one was Buschs calling card. The earliest is in the middle and is marked on the blade KASTOR & CO., OHLIGS GERMANY. A later example with spread wing eagle is on the left and is marked N. KASTOR, OHLIGS GERMANY. 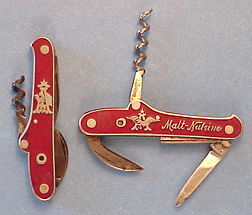 On the right is a 1952 production by Schrade of Walden, New York. It is marked SCHRADE WALDEN U. S. A. and STAINLESS STEEL. A 2 1/2 spread wing eagle knife with scissors without corkscrew. Adolphus own name appears on this one and, perhaps, he gave this one to the ladies. 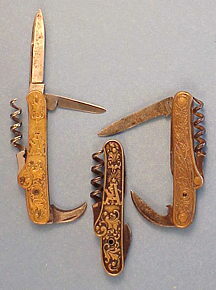 Three brass handle Anheuser-Busch knives. 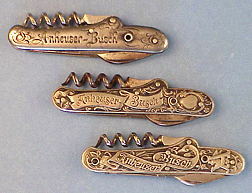 Top to bottom markings on blades: ANHEUSER-BUSCH GERMANY; ANHEUSER-BUSCH MADE IN GERMANY; A. KASTOR & BROS., WARRANTED CUTLERY / ANHEUSER-BUSCH GERMANY. 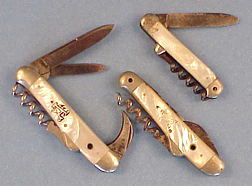 Three nickel silver handle Anheuser-Busch knives. Note that the bottom one has two stanhopes. 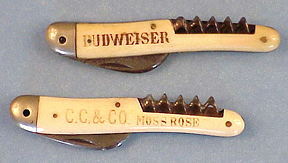 Top to bottom markings on blades: ANHEUSER-BUSCH MADE IN GERMANY; ANHEUSER-BUSCH MADE IN GERMANY; ANHEUSER-BUSCH GERMANY. Two red enamel knives. 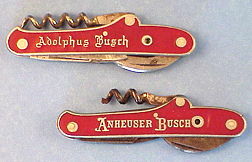 Top: Adolphus Busch and Malt Nutrine with spread wing eagle. Marked A. KASTOR & BROS., WARRANTED CUTLERY ADOLPHUS BUSCH GERMANY. Bottom: Anheuser-Busch and the closed wing eagle trademark. Marked ANHEUSER-BUSCH GERMANY. 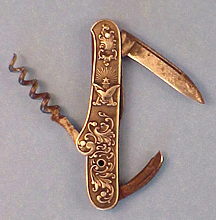 A rare example of an A-B knife with only Budweiser on it. 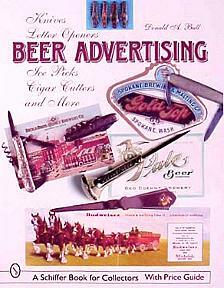 Beer Advertising:Knives, Letter Openers, Ice Picks, Cigar Cutters,and More - This book gets right to the point. In over 500 photographs Donald Bull looks at the many types of beer advertising objects which are pointed or sharp. Knives, letter openers, and ice picks readily come to mind when one thinks of sharp objects with beer advertising. In his view of the subject, Bull goes much further and includes corkscrews, cigar cutters, scissors, writing instruments, ice scrapers, forks, ice tongs, box cutters, screw drivers, nail clippers, toothpicks, and can openers. The reader will even find fishing lures, sewing kits, combs, and golf tees. While the reader is enjoying the glorious photographs of the many treasures, he will find the book is peppered with Beerbits, Bizbits, and Bullbits to inform and entertain him. Hell learn about the breweries and brands advertised, the makers of the objects, and share many of Bulls own insights. A brewery / brand index and a manufacturers index are included for easy reference.